Icelandic horses are between 125 cm and 145 cm (49”-57”) when measured with a stick at the highest point of the withers. They are stocky but elegant, with good strong legs. Their beautiful heads, with large eyes, show trust and character. Conformation may vary considerably, but a typical Icelandic horse is rectangular, compact in shape, and has a sloping croup. Icelandics are one of the few horse breeds which exhibit nearly all possible colours! While the majority of them are chestnut, brown, bay or black, there are many other shades, including dun, buckskin, palomino, white, grey, dapple, piebald and skewbald. The rarest colours are wind dapple and roan. Their thick feathers, developed in the harsh Icelandic climate, and their extremely long, thick winter fur are also characteristic of the breed. In the spring, they shed and change their winter coat to short, flat and shiny summer hair. Manes and tails are luxurious and thick year-round, and they are never cut or plaited. Generally speaking, the Icelandic horse is an ideal family, pleasure, show and trail horse – all in one. While each animal has its own personality and character, there are some traits you should find in every Icelandic horse: very good natured, friendly and trusting towards people. When raised correctly there should be no biting, trampling or climbing. The Icelandic horse is a four or five-gaited horse, making it exceptional in comparison with most other breeds. It addition to the three basic horse gaits (walk, trot, canter/gallop), a four-gaited horse can also tölt. In tölt, the horse carries itself proudly and gives a very smooth ride, enabling the rider to cover long distances without getting tired. A tölting horse can be ridden from a leisurely “working” speed up to as fast as a racing speed. A fast tölter can reach speeds close to 20 mph. Icelandic horses tölt naturally, many young foals are seen tölting in the field; however, every horse offers a different combination of gaits. For some horses, tölt is their favourite gait, while others prefer to trot. Icelandic horses have gained most of their popularity due to their ability to tölt. For an Icelandic horse enthusiast, there is no greater pleasure that enjoying nature while riding a good tölter. A five-gaited Icelandic horse has the ability to pace. This is a lateral gait with a moment of suspension. Pace is a racing gait and is only ridden over short stretches of several hundred metres. The horse shows an enormous amount of power. Good pacers are racehorses: highly strung, vibrating with energy and eagerly awaiting the start. That is why most owners who are using their five-gaited Icelandics for pleasure riding do not train the flying pace with their horses. Slow pace – called “piggy pace” – is regarded as a fault and is often found in horses that are not ridden correctly or horses that cannot tölt. In their home country, Icelandic horses – except for riding and work horses – have traditionally been kept in big herds. In autumn, they were rounded up from the hills and brought down to winter near the farms. Until recently, many of the horses were not fed and had to find their own forage in the huge fields, even through the worst winter weather. Feeding hay or hard feed to out-wintering horses is a relatively new practice. The Icelandic horse has adapted to these harsh conditions and developed excellent social skills in order to secure survival for the herd. They are ‘easy keepers’, capable of dealing with extreme weather conditions. Many of the Icelandic’s positive characteristics are due to having been kept over the centuries in the traditional way. The horses retain their natural herd instincts. They treat humans with respect, because they have been handled only occasionally. Although it is extremely difficult to completely copy an ‘Icelandic lifestyle’ for horses living in Canada, horses should be kept as close to their natural state as possible in order to preserve the unique characteristics of the breed. For example, in their natural environment mares will usually foal without complications and without requiring supervision. They should live and grow up in herds, to maintain social contact – preferably with other Icelandic horses. Some Icelandics should live out in large fields with shelters, year-round. Some may require restrictions to their access to grass, which is rich. In winter, the ideal shelter for a herd is an open barn with an adjacent paddock with an all-weather surface. Riding horses which are in training for a limited amount of time should have access to an open stable with an adjacent paddock, as long as the horses have company. 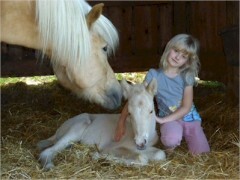 Foals and youngsters must not be kept on their own. Small breeders should consider sending their youngsters to larger stud farms where they can grow up in herds and develop vital social skills. Keeping horses out all year does not mean leaving them to their own devices. The herd needs to be checked regularly, in case any problems arise. 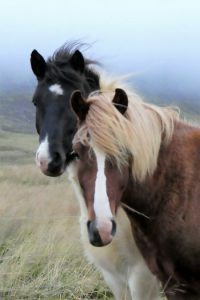 When kept according to the above guidelines, Icelandic horses will be friendly, well-adjusted and happy riding horses. They usually stay sound until their late twenties, and sometimes even into their thirties. Apart from the joy of riding a fit, happy and healthy horse, it is also fun to watch the horse’s behaviour in the herd. One can learn much about its character, and about horses in general, by doing this. Icelandics are a hardy, healthy breed. 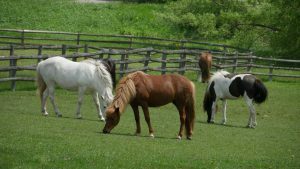 Horses born in Iceland and brought to Canada may, however, be prone to sweet itch – also called summer eczema. This is an allergic reaction to the bites of our mosquitoes, gnats and midges. The horses rub their manes, tails and bellies, and suffer from terrible itching. As a general rule horses born and raised in Canada do not suffer from sweet itch, because they develop immunity to these kinds of bug bites. Like all other horses, Icelandics must be wormed regularly. They are usually vaccinated for Tetanus, Influenza, Rabies, Western and Eastern Encephalitis – and possibly Herpes and West Nile virus. Owners should discuss the Strangles vaccine with their vets before making a decision about whether or not to administer it. There are differing opinions about the vaccine. The ability to perform special gaits (tӧlt) does not make the Icelandic horse prone to suffering from arthritis, founder or any similar conditions. The fertility rate of the Icelandic horse is high and both sexes can be fit for reproduction up to 25-28 years of age. Icelandic horses mature late and are only trained to ride as five year-olds. They are not fully grown until the age of 6 or 7. They are known for their long life span. 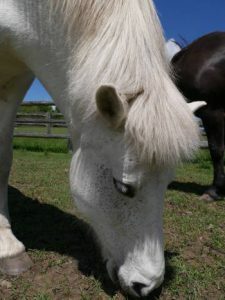 It is not unusual for an ‘Icy’ in his late twenties to still be in working condition. The oldest known Icelandic horse in Germany lived for 47 years! The Icelandic horse breed is hardy, and as mentioned earlier, they are “easy keepers”. It is important to keep their origins in mind when considering their diet. Feeds, hays and grasses that are too rich and abundant can cause unhealthy weight gain, for example. Members of our group can offer good advice about feeding and care. 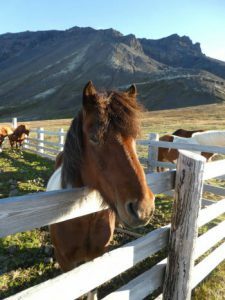 If you are not familiar with Icelandics (or with horses in general) and don’t know what to look for or expect from this unique breed, it may not be easy to choose a horse that is right for you. We would like to help you with such an important decision, so we have created a quideline for buyers. Purebred Icelandic horses: A horse can only be called an ‘Icelandic horse’ if all its ancestors can be traced back to Iceland. This applies to both sire and dam and is verified through DNA testing and stallion reports submitted to the CLRC. The DNA verification ensures that the horse is a purebred. The CLRC will only issue certificates of registration if this information is given to them. Every Icelandic horse must be registered in the country where it was bought. Four-gaited horse: A four-gaited horse usually prefers to trot if moving freely, but should tölt easily if ridden. In addition to trot and tölt, it should show walk and canter/gallop. Five-gaited horse: A five-gaited horse offers the pace in addition to walk, trot, tölt and canter/gallop. The five-gaited horse must be able to do pace at a racing speed when under saddle. This ‘flying pace’ is as fast or faster than a gallop. The slow form of pace, called ‘Piggy Pace’, when horses are not ridden correctly or if they are not able to tölt, is considered a mistake. 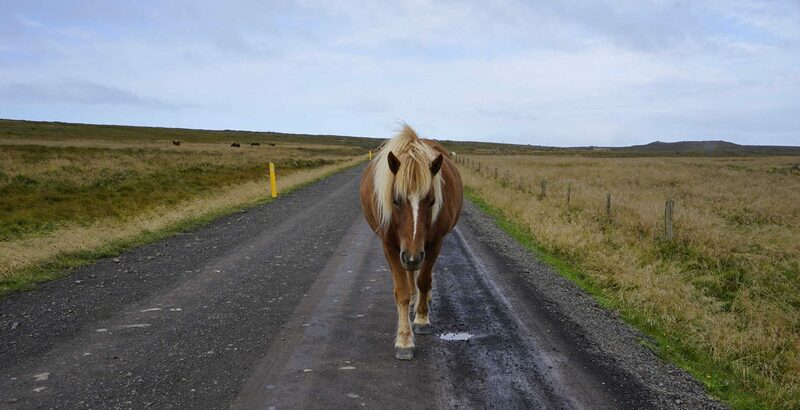 Not all Icelandic horses are able to tölt – some will only be able to trot or pace (often Piggy pace). Depending on your own riding experience, you might choose between a green Icelandic horse (one which has just begun to learn the riding basics, especially tölt under saddle) – and a fully trained one that can teach YOU how to ride and enjoy the Icelandic – especially its magical tölt! If you do not know how to ride at all or have very little experience, you should consider buying a trained Icelandic horse. If you want to buy a young horse that has not been ridden, it is always good to ride the dam and/or sire or a full brother or sister. This may give you an idea of what a horse might be like when it reaches maturity. Watch the horse’s gaits in the pasture. Preferably, you should see tölt and trot in combination with a good canter/gallop. Young horses, even if not started but just handled for trimming, worming, etc., should be easy to approach. The young horse might be shy but should not be afraid of people. When buying an untrained horse, you should consider sending it at about 5 years of age to an experienced Icelandic horse trainer. Consider the costs for this extra training if you are thinking about buying a cheaper, untrained horse, as opposed to a trained, more expensive one. You should also find sensitivity, a willingness to please while being handled and ridden, respectful behaviour toward people, easy to approach, self-confident but not stubborn, and able to tölt. There is an international system in place for the evaluation of Icelandic horses. The criteria have been developed by FEIF (International Federation of Icelandic Horse Associations) and accepted as the worldwide standard. A horse is judged for its gaits, temperament, character and conformation. A FEIF evaluation provides notable information about a horse or its parents. An evaluation of over 8.0 gives the animal elite status. The horse’s registration papers have to be officially transferred to the new owner after the horse has been paid for in full. Here in Canada, the pedigree must be sent by the seller to the Canadian Livestock Records Corporation (CLRC) for transfer to the new owner’s name. Be sure that all requirements are met by the seller in order for the horse to be properly transferred to your name. Confirm in writing all agreements between yourself and the seller. Insist on a bill of sale or a purchasing agreement. Ask for the latest vaccination certificate, worming date and the last time the hooves were trimmed. The price range of Icelandic horses may be a little surprising, but keep in mind that this is a truly unique breed! They are robust and easy to keep. When well cared for and properly exercised, they can live much longer than other breeds of horses. They are versatile, good-natured and suitable for all ages of riders, from beginners to seniors. Well-trained Icelandics, as well as first prize stallions, mares and their offspring, are more expensive to buy, as is the case with any breed of horse. Tradition says that every horse you buy should come with a halter and lead rope. Be well prepared for the arrival of your Icelandic Horse. Do not stable your horse and do not keep it alone. If you are able to turn it out with one or more other Icelandic, all the better.